These are two distinctly different files types produced by your digital camera. RAW is a large, uncompressed flat file that contains all of the image data captured by the sensor before any post-processing is applied. RAW files require a 2-step process to generate an image file that can be shared or printed. 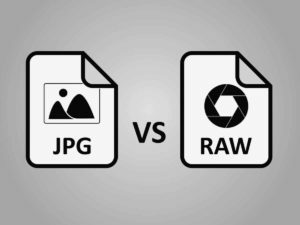 RAW files are also significantly larger size than JPEG because they contain all of the image information from the sensor. JPEG on the other hand is a compressed file processed in your camera immediately after taking the photo. When you select JPEG, your cameras internal software compresses the image internally and creates a ready to use image. Seasoned photographers usually shoot RAW and JPEG simultaneously. In RAW files, you get all of the image information picked up by the camera senor in an unfinished and unprocessed format. 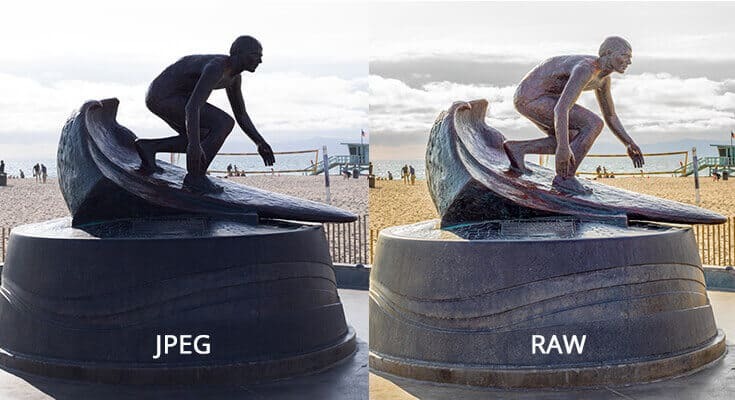 RAW files have significantly more information than JPEG’s, so you will be able to adjust exposure on shadows, highlights, and white balance, and more depending on the software you’re using. RAW files are proprietary based on the cameras manufacturer. Each manufacturer has its own RAW file system. Nikon uses NEF, Canon has CR2, and so on. JPEG on the other hand is a commonly used universal image file format. RAW is not an image file that can be shared or printed until it is processed and saved in a usable format. You cannot use a RAW file for anything until they have been processed (no printing or sharing on social media). RAW files are flat in appearance when you initially open them and you need photo editing software to process the file. Manufacturers usually include software to process RAW files. Canon uses ImageBrowser EX, Nikon ViewNX, etc. or third party applications like Adobe Lightroom or Photoshop. The advantages of RAW are; higher quality images with greater details and more flexibility in post production. With RAW, you can change; white balance, add sharpness, add contrast, and other things. With JPEG, the image has already been processed and you can only make minor changes. It’s recommended that you use JPEG for casual shots that require little to no post processing and RAW for more important images where editing may enhance the image. Some photographers use RAW to capture the maximum amount of dynamic range out of the camera. For high dynamic range shots, shoot in the middle of the range and use the histogram to maximize the tonal range. If you shoot RAW+JPEG, keep an eye on memory because your memory card will fill up very quickly. If you’re shooting action or sports photography in RAW, your FPS (frames per second) could be impaired while the camera transfers data to the memory card. In those instances where you want to shoot sport in RAW, a faster memory card may help.